The elastic cord suspension of this JumpSport Trampoline is twice adjustable so that you can choose the degree of hardness. 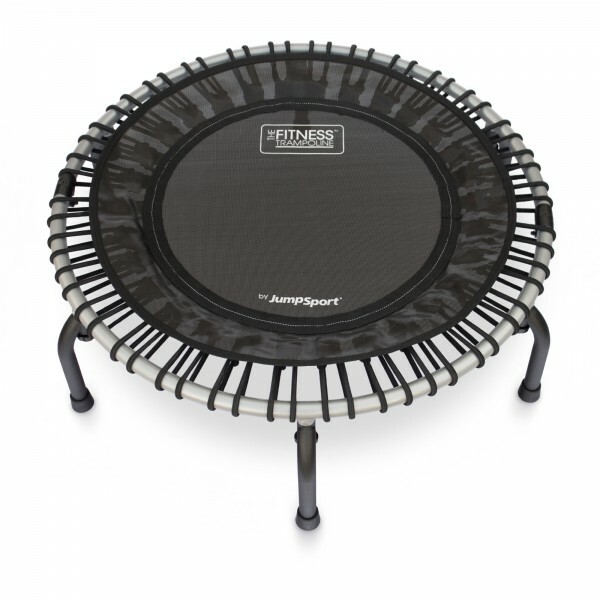 The fitness rebounder provides superior stability and is also available with a folding frame! Jumping on a trampoline is effective. Even light jogging on a fitness trampoline can help you burn up to 25% more calories than jogging on hard surfaces. But this is by far not the only advantage! An rubber cord suspension system makes exercising with this trampoline even more joint-gentle. The bounce is soft and slowed down smoothly. The physical work while rebounding is totally different to that of regular jogging or jumping. The body gains momentum more quickly, but the exercise doesn't feel that strenuous. The rubber cords are twice adjustable so that the training can be made more varied or meet your requirements. Perfect about this small fitness trampoline is that it can be used at home easily. Exercising on this rebounder requires hardly any prior knowledge. Rubber cords make this indoor trampoline a silent piece of fitness equipment. This way you can do your workout in front of the TV and watch your favourite program. Furthermore, rebounders can be stored easily! The legs of the folding frame version can be detached quickly due to special screws being used. The Jumpsport Fitness Foldable Trampoline 350F can then be folded in the middle and stored or transported more easily. This is ideal for taking your trampoline on holiday, i.e.. The product is extremely well made and assembly was very straightforward. The accompanying CD was very clear and also showed that various achievement levels were possible. We both felt inspired that this was really something we could do and enjoy. Sturdy and well-made. A bit difficult to set up - really needs two people to unfold it. Excellent value - I haven't seen another cord-type rebounder at this price. Completely silent. Jumpsport Fitness Foldable Trampoline 350F add to comparison list.